Planting the New Garden – Dig Delve – An online magazine about gardens, landscape, growing & making. There is a point when winter turns and spring takes over. It inches at first, and then that false feeling – that you have time on your hands – begins to evaporate. 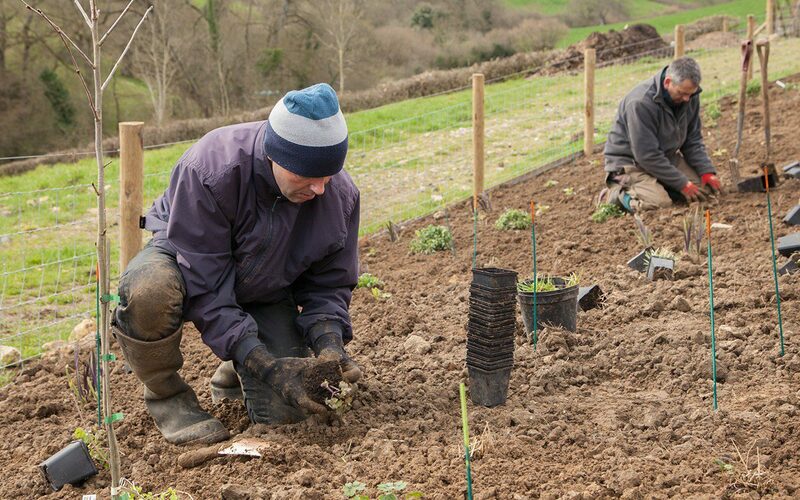 This year I have been watching for the change more intently than usual, because we had a date in the diary to plant up the first phase of the new garden; the week of the spring equinox which, this year, proved to be perfect timing. One week later and the peonies were already a foot high and the tight fans of leaf on the hemerocallis were flushed and beyond moving without setting them back. I have been planning for this moment for three years, perhaps longer in refining the idea of the way I wanted the planting to nestle the buildings and blend with the land beyond. I procrastinated over the final plant list for as long as it was possible, but in January it finally went out to the nurseries in time to get the stock I needed for spring. 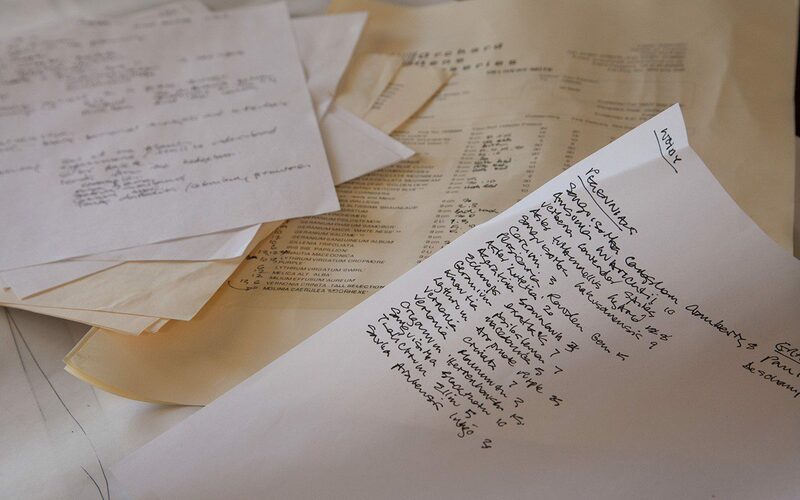 The process of refining a plant palette is one that I know well, but committing a plan to paper is an altogether more difficult thing to do for yourself than for a client. 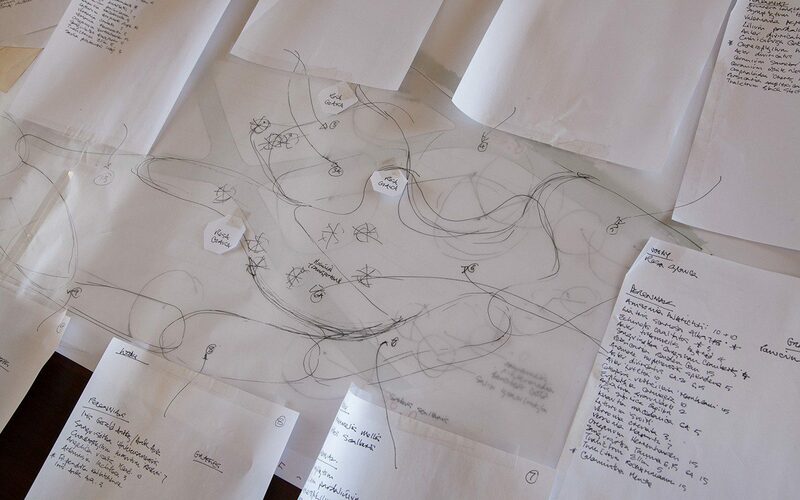 I decided not to make an annotated plan, but instead to map a series of areas that shift in mood as you walk the paths. I paced the space again and again to understand where the ground was most exposed, where it was free-draining and to note that, in the hollow where the ground swung down to the track, there was running water a spit deep this winter. I imagined where I would want height and where I would need the planting to dip, sometimes deep into the beds, to give things breathing space. There would also need to be countermovements across the site, with tall emergent plants brought to the foreground, close to the paths. The preparation was completed the week before the plants arrived; the soil dug in the windows when it was dry enough and then knocked out level just in time. We prayed that the weather would dry up, because the soil had lain wet all winter and would not stand footfall if it stayed that way. In tandem with the soil preparation we moved some favourites that I have been bulking up, like the Paeonia mlokosewitschii and Paeonia emodii ‘Late Windflower’, both of which came with us from Peckham, and split those plants that had passed the test in the trial garden. A three year old Sanguisorba ‘Cangshan Cranberry’ was easily divided into eight, and so three plants gave me twenty four to play with; enough to move from bed to bed and to jump the path. The same with the persicarias, the Iris x robusta ‘Dark Aura’, the Aster turbinellus and a long list of others. 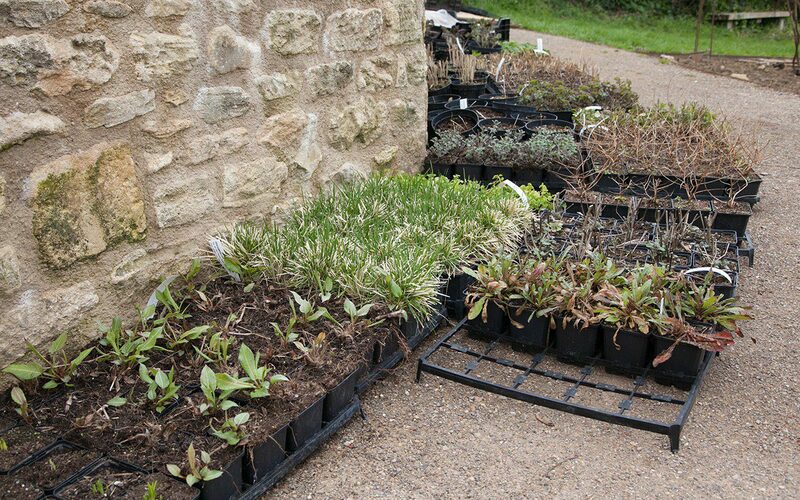 These were bagged up individually so that I could afford to leave them laid out when shifting the planting around on the day of laying out. 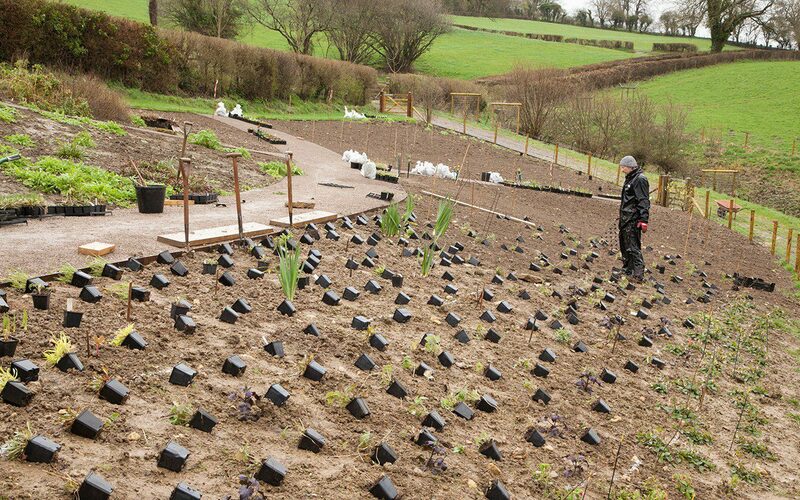 Due to the size of the site this was just the first round of planting, and of only half the garden. The remaining half will be planted this autumn. 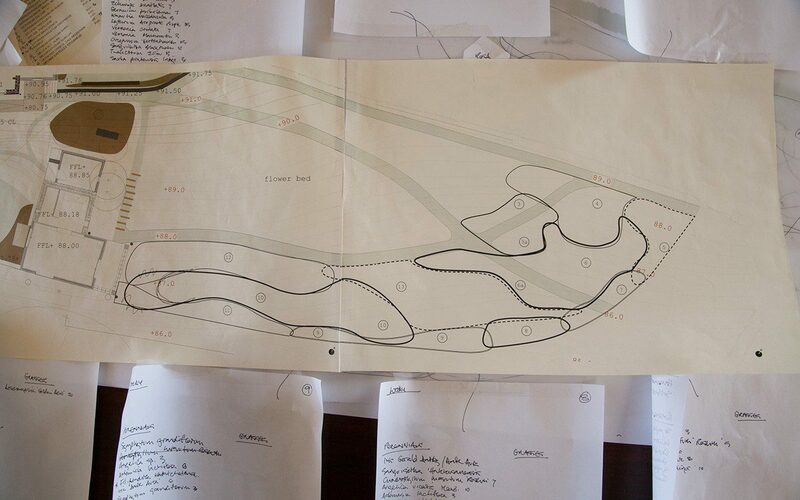 The plan for this lower half comprises a dozen interlocking areas, which allow my combinations to vary subtly across the site and flow into one another to form a related whole. 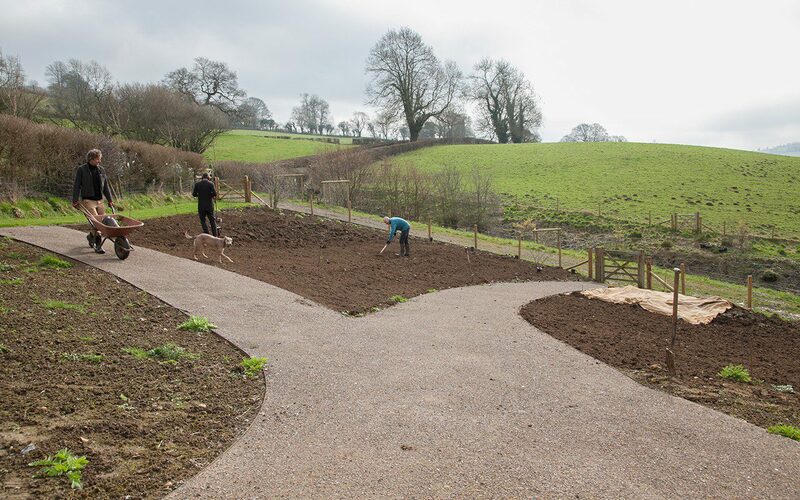 Before starting, the boundaries were sprayed onto the soil with a landscape marker, although I break these boundaries during setting out, jumping plants across to knit them together. Shrubs and woody plants were positioned first to articulate the space. Trees by the gates including Hamamelis x intermedia ‘Barmstedt Gold’ and Crataegus coccinea, some Malus transitoria and Rosa glauca breaking in from high up, and home-grown whips of Salix purpurea ‘Nancy Saunders’ and Salix gracilistyla fraying the edges alongside the field. Molinia caerulea ssp. arundinacea ‘Transparent’, the largest of the clump forming grasses, was also given its position early to tie the meeting point of the paths together. For each of the zones I made a list that quantified all of the plants I would need to make it special. A handful of emergents to rise up tall above the rest; Thalictrum ‘Elin’, Vernonia crinata, sanguisorbas and perpetual angelicas. When laying out these were the first perennials placed to articulate the spaces between the shrubs and key grasses. Next, the mid-layer beneath them, with the verticals of Veronicastrum virginicum ‘Album’ and Persicaria amplexicaule ‘Rowden Gem’, and the mounding forms of aster (A. divaricatus) or geranium (G. phaeum ‘Samobor’, G. psilostemon and G. ‘Salome’). The plants that will group and contrast. And finally, the layer beneath and between, to flood the gaps and bring it all together. These were a freeform mix; fine Panicum ‘Rehbraun’ with Sanguisorba officinalis ‘Tanna’, or Viola cornuta ‘Alba’, Coreopsis verticillata ‘Moonbeam’ and the white bloody cranesbill, Geranium sanguineum ‘Album’. 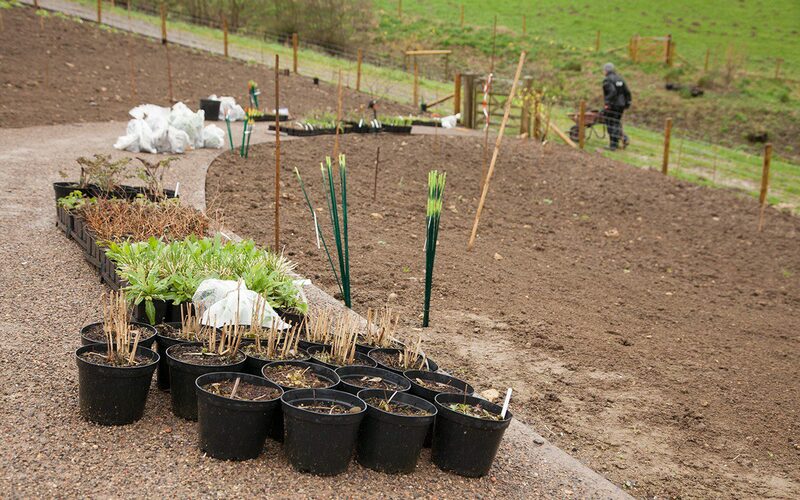 The plants arrived from Orchard Dene Nurseries and Arvensis Perennials on the Friday. Immaculate and ready to go and filling up the drive. I like to plant small with nine centimetre pots. If you get the timing right, and don’t have to leave them sitting around, this size is easily trowelled in with minimum soil disturbance. 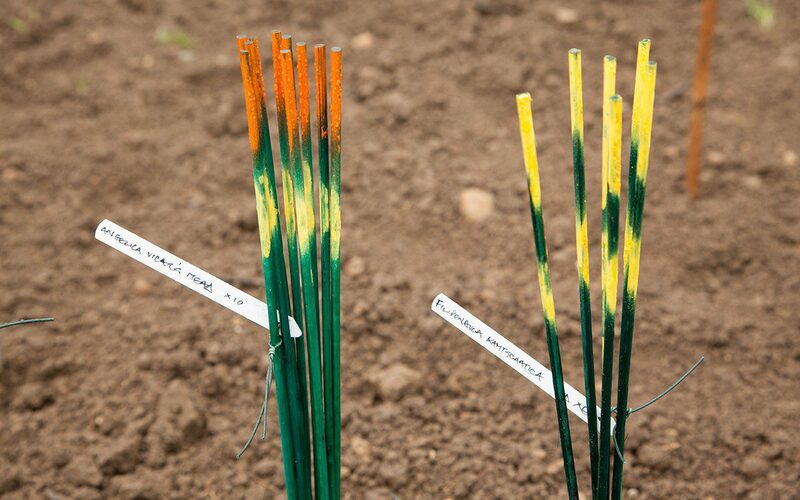 At close spacing this makes planting easier and faster than having to spade in a larger plant. It took us two days to complete the lifting and dividing of my stock plants and to set the plants on the paths in their groups. 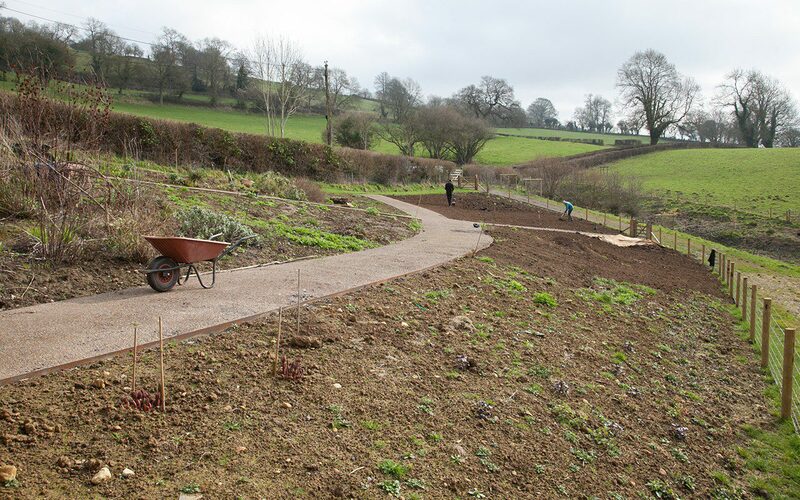 And the process was prolonged as I started adding last minute choices from the stock beds. 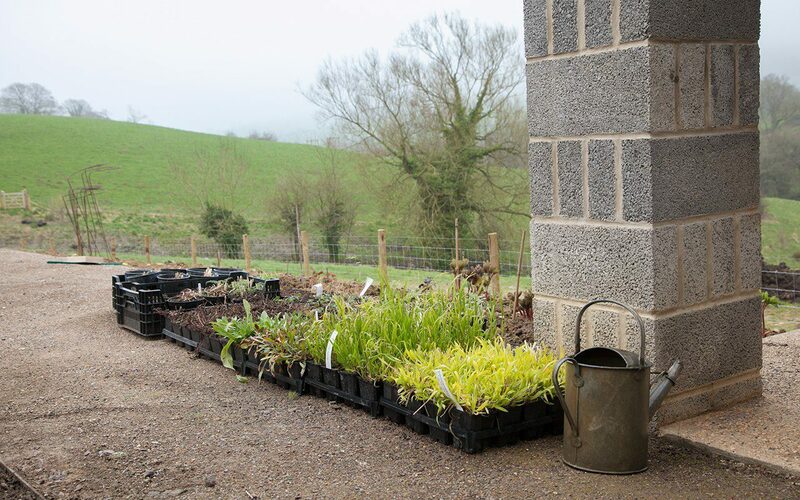 On the Sunday high winds whistled through the valley to dry the soil, so I started setting out and hoped that the pots didn’t blow into one corner overnight, as once happened in a client’s garden. On the Monday, and ahead of my team of planters who were arriving the next day, I continued to populate the spaces, between the heavens opening up and pouring stair-rods. It was hard, and there was a moment I despaired of us being able to get the plants in the ground at all. Setting out plants is one of the most all-consuming and taxing activities I know. It feels like it uses every available bit of brain-space. 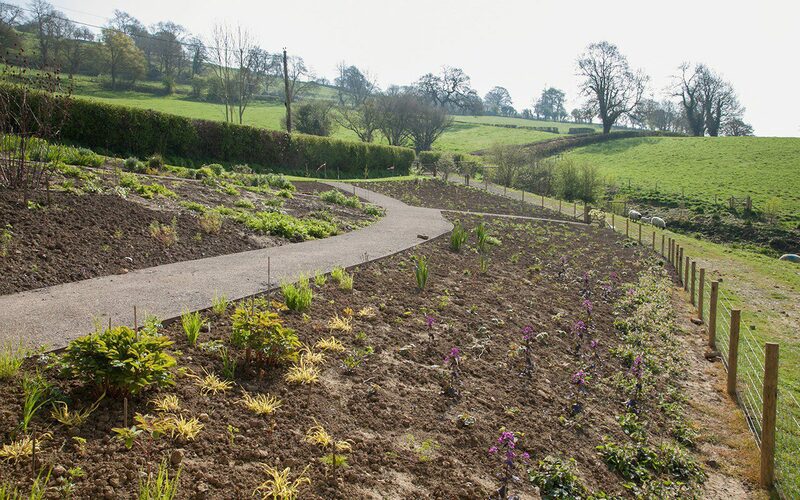 You not only have to retain and visualise the various volumes, cultural requirements and habits of the individual plants, but also the sequencing and rhythm of a planting, how it rises and falls, ebbs and flows, and then how each area of planting relates to the next, in three dimensions and from all angles. Add to this the aesthetic considerations of colour relationships both within and between areas and the time-travel exercise of imagining seasonal changes and there is only so much I can do in one session. However, I was ahead of my planters and, as long as I could hold my concentration once they arrived, it would stay that way with them coming up behind me. 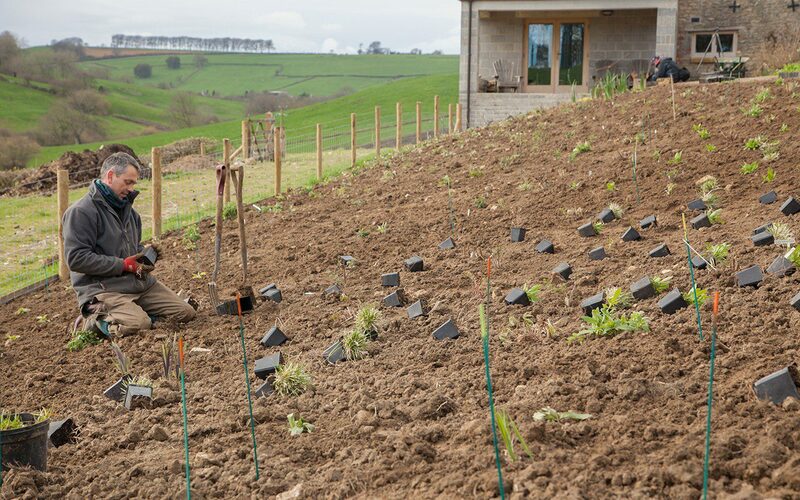 The rains abated, the wind continued and the following day the soil was dry enough for planting. On the 21st, the sun broke through not long after it was up. A solitary stag silhouetted against the sky looked down on us from the Tump as we readied for the day. Clearly word had already got out that there were going to be rich new pickings in the valley. 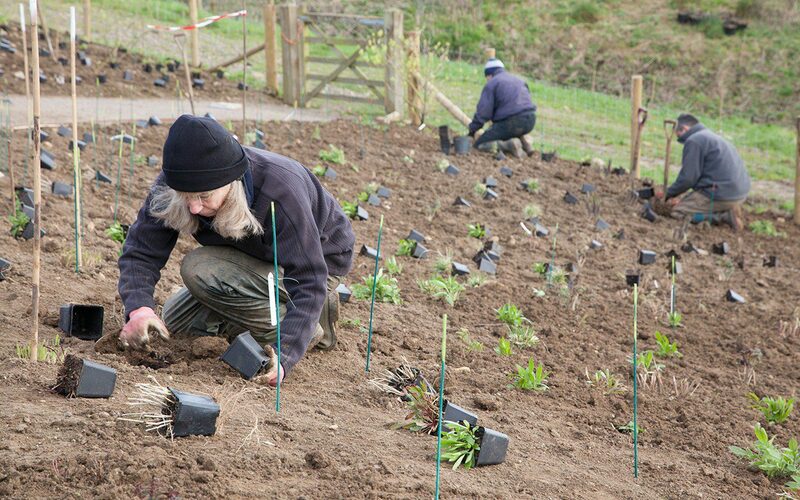 Over the course of two days about twelve hundred plants went in the ground. Three people planting and myself managing to stay ahead, moving the plants into position in front of them. Thank you Ian, Jacky and Ray for your hard work, and Huw for supplying a constant supply of necessary vittles. 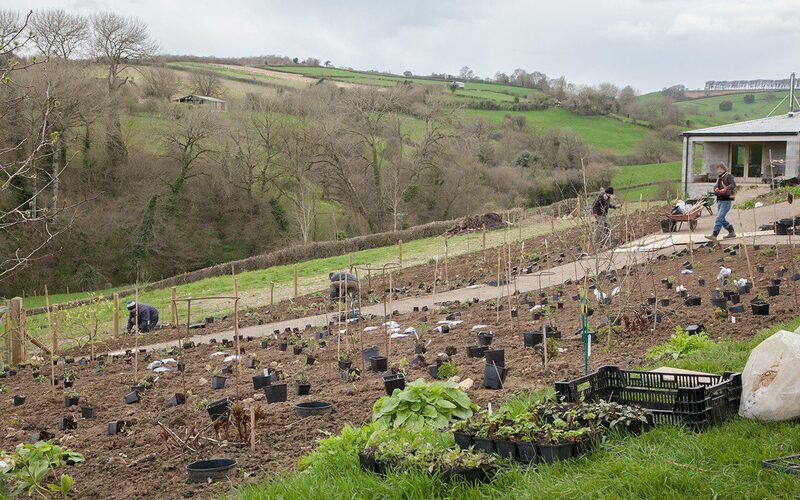 I cannot tell you – or perhaps I can to those who know this feeling too – what a huge sense of excitement is wrapped up in a new planting. Plans and imaginings, old plants in new combinations, new plants to shift the balance. All that potential. All those as yet unknown surprises. Already, the space is changed. We will watch and wait and report back.